Immerse yourself in the tranquility of this idyllic 110Â± ac ranch in Paso Robles wine country. 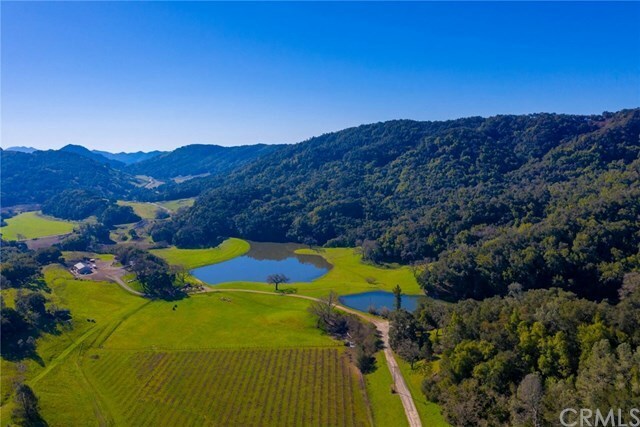 With picturesque panoramic views, acres of privacy & abundant wildlife, you can build your dream wine country estate complete with ocean views from the top of the parcel. Scenic land boasts 2 large ponds, year-around creek, flat areas for building, 24Â± ac plantable land, 22Â± ac pastures, livestock facilities, large metal barn/workshop, & manufactured home on foundation. Mins to acclaimed wineries, 10+ mi to charming downtown Templeton & Paso Robles. Situated in the 46 West Corridor at western corner of original historic ranch, Rancho Asuncion. Terrain consists of large flat areas, rolling hills, & mountainside up to ocean view ridgeline. Abundant trees include oaks, bays & madrones. Water includes 2 large spring-fed ponds with bass fishing, year-around creek, 2 horizontal wells, spring system with solar pump & 9,000 gall water storage. A desirable microclimate, avg rainfall is typically 2-3x areas to the West/East, per seller. Livestock amenities include 4 pastures (approx. 22Â± ac), pens/corrals/livestock facilities with pipe fencing & chicken coop. 35â x 85â barn has metal siding/roof & workshop. As-is manufactured home on foundation offers 3 bd/2 ba, vaulted ceiling, new septic & covered porch. Property accessed from both Hwy 46, with easement, & Old Creek Rd. 18 mi to muni airport, 30 mi to regional airport. Own a slice of wine country paradise with this scenic secluded property. Directions: Take Hwy 101 to Hwy 46 West toward Cambria. After Old Creek Rd, first gated driveway on left.